Taylor, 86, agreed to a suicide pact with his wife that they attempted to execute on December 10 at Montana de Oro State Park. Gewynn, 81, died, but George did not, and a park ranger discovered him driving with his wife’s body in the car. Taylor spent two days in jail on a murder charge, but the San Luis Obispo County District Attorney’s Office reduced the charge to assisted suicide. Both Taylors attended weekly Board of Supervisors meetings and spoke on issues affecting Los Osos. Several speakers from Los Osos paid tribute to Gewynn at Tuesday’s supervisors meeting. One delivered a three minute video presentation in her honor. Richard Margetson left flowers on the Taylor’s typical two seats in the supervisors’ chamber after speaking about Gewynn during public comment. Supervisor Bruce Gibson, whom the Taylors frequently criticized, also praised the Taylors after Tuesday’s public comment, but said that he disagreed with them on most issues. 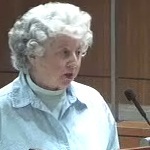 In February 2011, Gewynn Taylor warned Gibson that his attempt to persuade Los Osos residents to use equity in their homes to pay for the sewer project could lead to suicides in the community. I read in the local throw away (AKA Trib) that they are going to charge him and give him parole, after the first of the year. All things considered I think that they made a wise decision not to jail him.